By hhorizontal, I mean a build that is parallel to the earth's surface;; vertical is perpendicular thereunto. I think Law may ve usinga different convention. I posted that while lying on the floor, feet on the wall. Also, on not having slept the night before. Brief or KS keep you up??? As I live and breathe! That's certainly the peak of this thread! Anyhoo -- one thing about horizontal building. Long-time users would have not expected a great deal of compatibility horizontally, because DF has never really been designed for that. Some pieces -- like the double doors and the free-standing columns in WA3 -- are expressly higher than the regular walls, making it impossible to integrate them into a higher build. Same thing goes for the doors in one of the later sets -- they were very nice doors, fancier than the regular resin doors, but they were at least .25 inches higher than the walls (an unofficial, eyeball, from memory measurement). Similarly, the resin caverns curve all over the place -- even with the chasm set, which is expressly FOR THE PURPOSE of horizontal builds, you have to be careful about where you place things. There are gaps, there are waves, there are minor height discrepancies. Even the curved chasm floor which lines up 90% of the way with the curved cavern piece, to make a perfect little ledge, won't be stable -- it's stable on the free-standing curved wall with the same footprint, but the actual curved cavern corner has a little "bubble" of height in the middle that tends to make it wobble. I always have to balance and stabilize that piece when I do builds for pictures, and often I'll just swap out the curve for a flat cavern floor and free-standing curved wall for that arrangement. So -- yeah, it's expressly designed to go together, but it doesn't quite line up right to be perfect. About the only resin sets that work seamlessly for horizontal builds are the MBS sets and ROTA sets, IIRC. Those work perfectly, and with MBS in particular it is really nice because you can do a lot of very fun things by adding height to MBS structures. I rarely do one-level MBS builds, the stairs and stackability is just too fun to pass up. But, yeah -- anyone who's used DF in the past recognizes that it's primary purpose was to serve as a way of doing detailed, 3-D floorplans. There wasn't much height, you didn't have ceilings or high doors, you didn't have full structures. 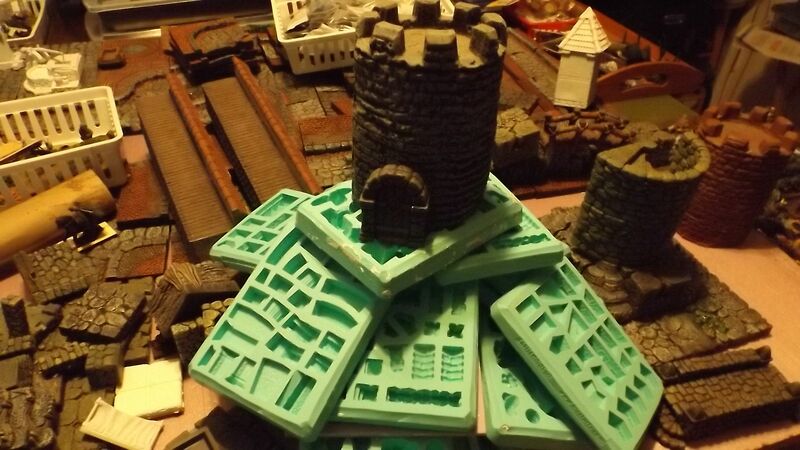 And while stacking could create a semblance of that stuff, when people did it well (like Invincible Overlord) it was always very clear they were using the pieces in ways that weren't originally intended. So it would be natural to expect to have to tinker with things. With CBS, horizontal building is crucial, it's built right into the model. Precision was of the utmost importance. It stands to reason things would have to be standardized to go forward. So, yeah, yet another reason to think that, going forward, Dwarvenite should be standardized to match precisely with CBS dimensions. And resin need not, but should remain basically compatible with itself, i.e. done the way it always was. I'll never give an inch in this conversation. But a few millimeters shouldn't be a problem, right? I certainly wouldn't waste my breath on it. Audles wrote: This certainly did a lot to scale back my concerns.